All roll up door curtain material is hot dipped galvanized steel, primed and painted with a premium paint finish. All colors are reproduced for this chart as accurately as possible, actual material and color samples are available upon request. 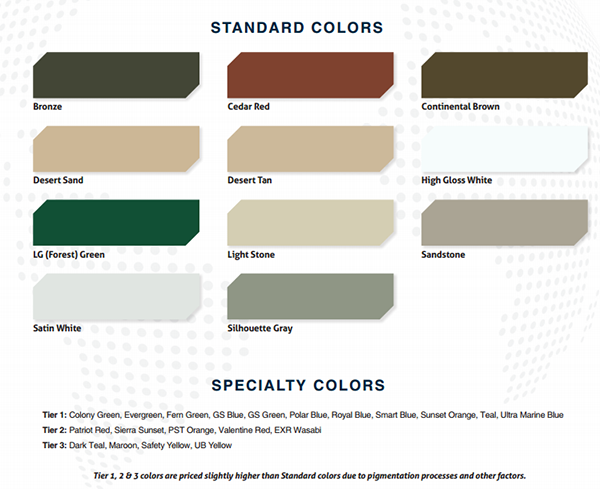 Click here for the PDF color chart. Super Durable Polyester paint offers greater flexibility, corrosion resistance and hardness… all important features when you consider the daily wear and tear on your steel doors. All Super Durable Polyester paint colors shown are stocked as standard colors and backed by a film integrity warranty for forty (40) years guaranteed to hold up against peeling, cracking, blistering, flaking, splitting or delaminating. In addition, these colors are guaranteed not to fade or change color for twenty five (25) years. Refer to the complete official warranty in this brochure. Pricing Update: An up charge will be applied to the following door colors: Patriot Red, Bronze Polar Blue, Safety Yellow, Fern Green, Valentine Red, Uncle Bob's Yellow, Extra Green, Evergreen, Tangerine, Maroon, Light Stone and Sandstone.